Create a new look in your home when you install a set of tile flooring from our local room. Whether you are looking for slate, porcelain, or ceramic tile, you are sure to find something you love when you shop with us. Our collection of tile flooring is designed to breathe new life into bathrooms, kitchens, and entryways. We invite you to visit our showroom for the inspiration you need to transform your residence. When it comes to strength and appeal, nothing beats the timelessness of ceramic. Combining durability with stunning beauty, ceramic is a top material for many homeowners. Ceramic tile is a popular flooring choice due to its durability and natural beauty. It is an ideal flooring choice for any room. Available in a range of shapes, sizes, and colors, ceramic tile is a perfect fit for spaces of all sizes. Our design team is happy to meet with you to discuss your options. We work with you to choose the right options for any part of your residence. 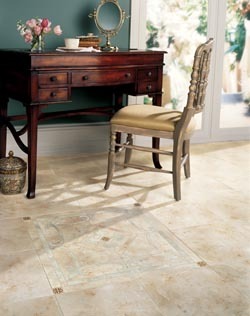 From bathrooms to hallways, porcelain tile adds beauty and elegance to any part of a home. This popular flooring option delivers the elegance you want in a style that you are sure to love. Porcelain is resistant to stains and water, making it a versatile addition to every room. Are you looking for a durable solution to your flooring needs? While slate tile is a popular option for outdoor pathways, it is a great addition to indoor spaces. This natural-looking material is made to last for years to come without the need for regular maintenance. Because it is designed to hold up to heavy use, it is ideal for spaces like garages, basements, and other areas that see heavy foot traffic. Once you have chosen the right set of tile flooring for your home, turn to us to complete your project for you. For your convenience, we offer full installation services for each of our products. When you work with us for your tile flooring installation, you can trust that your project is in our capable hands. Our experienced contractors work carefully to ensure that every tile is positioned in the right place. With us on your side, you will ensure a flawless finish to your projects. Contact us to browse our selection of tile flooring for your home. We feature a full collection of slate, porcelain, and ceramic tile for customers throughout Williamsport, Pennsylvania.